The CFHS robotics team (Team 525) made it to the semifinals in the Kansas City Regional FIRST Robotics Competition on Saturday. Feb. 28. “The object of the game is to put moon rocks into other robots’ trailers that they carry at the end of their robots. 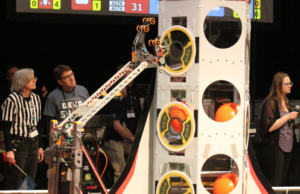 There are two alliances that compete against each other and the match last two minutes 15 seconds with a 15 second autonomous period where the robots are controlled completely with preprogrammed code,” senior Deanna Ament said. The team had a very successful day on Saturday. They were even picked to be an alliance for the semifinals. “It was so exciting to be on the floor and discuss strategy with the other teams. When I heard we got picked for the finals, I screamed and freaked out. It is neat to meet other people and see how so many of them solve a single problem in so many different ways,” Ament said. Cedar Falls was one of the few schools that competed in the finals. “There were a total of 61 teams there, and we ended up getting picked by the 4th-seeded alliance and ended up going into semifinals and losing to the first alliance, which means our alliance got third,” Ament said. The team improved a lot throughout the weekend. “At the end of Friday, we ranked 46th out of 61 teams, behind the team with the robot who could barely coordinate dumping balls, but had a great showing Saturday. 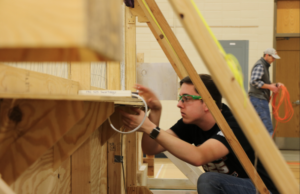 We managed to move our rank up to 20th and most importantly get picked as alliance partners with the 4th-ranked team to move on to the quarter finals and then semi finals,” senior Michael Miller said. An impressive ranking wasn’t the only thing the team brought home this weekend. “We won the gracious professionalism award, an award for helping other teams. It was great recognition for specifically one of our mentors who helped so many teams out,” Miller said. The team showed some outstanding character while at the competition to obtain the award. “We won the award because we helped a team who had their trailer stolen. Mr. Swartley came up with the idea to donate our MasterCard gift cards to team 1108. We asked around and collected over 20 donations, so we collected about $2,000. Also, Neil Kruempel, one of our main programming mentors, went around to teams in need and helped them program their autonomous modes or helped with their drivers’ stations,” sophomore Emily Hurban said. Although they did win the award, they didn’t help the other team just to get it. “It was really neat just to help a team in need just because we wanted to and not for recognition,” Ament said. However, when the announcer confirmed they won it, the team was more than thrilled. “During the award ceremony, I leaned over to Hannah Howland and whispered ‘I want this so bad.’ When the announcer started listing off things we had done I was making a mental checklist. I was in so much shock when we actually got picked. I think I jumped about 10 feet into the air. Everyone there was so happy for us. That award means more to us than if we had actually won the Regional,” Hurban said. On Monday, March 2, Swartley and most of the driving team — Jennifer Hurban, Hannah Easton and Chris Guetzlaff — drove to the capital in Des Moines where they will be in the lobby area to talk about and showcase the robot to the legislators.